Fundraising and electoral success depend upon more than party labels or deep-pocket candidates. For legislative candidates the key factor is their own incumbency status, though whether their party is in the majority and thus has policy-making control of a legislative body or not makes a difference as well. On average, U.S. House Republicans have a slight fundraising advantage over Democrats. But incumbent candidates of either party have an enormous fundraising advantage, collecting on average about six times the amount raised by challengers. Majority party status provides a 10 percent bonus to incumbents. Nationally, as this chart shows, Republicans in the U.S. House of Representatives were at a fundraising disadvantage as the minority party from 1980-1994. 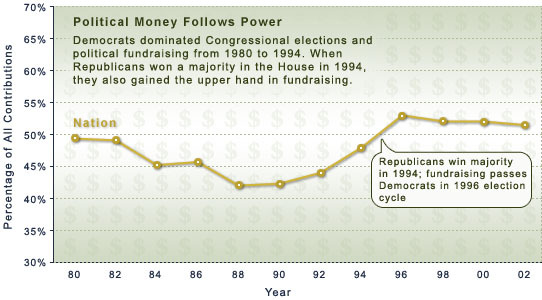 After Republicans won majority control of the House in 1994, they took the lead in raising campaign dollars in the following election cycle (1996), when the line in the chart crosses above 50 percent of total contributions to the two parties. Full Source: Data compiled and calculated from biennial Federal Election Commission (FEC) data downloaded from http://www.fec.gov. Estimated incumbent fund raising advantage is based on a comparison of average incumbent and challenger receipts in House races between 1980 and 2002. The fund raising value of majority status is from Cox, Gary W., and Eric Magar. 1999. "How Much Is Majority Status in the U.S. Congress Worth?" American Political Science Review 93(2): 299-309.